My daughter had a Tangled Birthday Party and I’ve already posted about the decorations and the cake. But, no party is complete without activities. When I think of Tangled, three things came to mind – lanterns, painting the walls, and Pascal. Earlier this year, AnnArbor.com had an article on making paper lanterns that I immediately knew would be perfect for a Tangled party. I was right. The kids loved them. I bought a pack of 8.5×11 scrapbooking paper in shades of purple that was perfect. You could also do other sizes of paper. 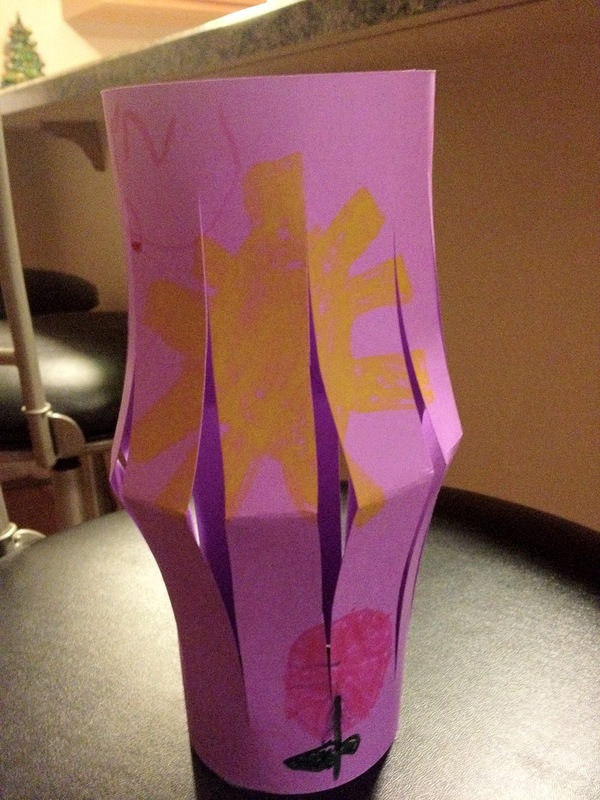 I let the kids draw their pictures and then I had an adult cut the paper for the lanterns and helped them glue them. I did not have enough child friendly scissors to let the kids do their own and I was not about to let a bunch of 5 and 6 year olds loose with regular scissors. I would have loved to have the kids paint the walls, but that was not going to happen even with the walls lined with paper. Had it not been winter in Michigan, I would have put paper up in my garage or on the deck and let the kids use markers or crayons. 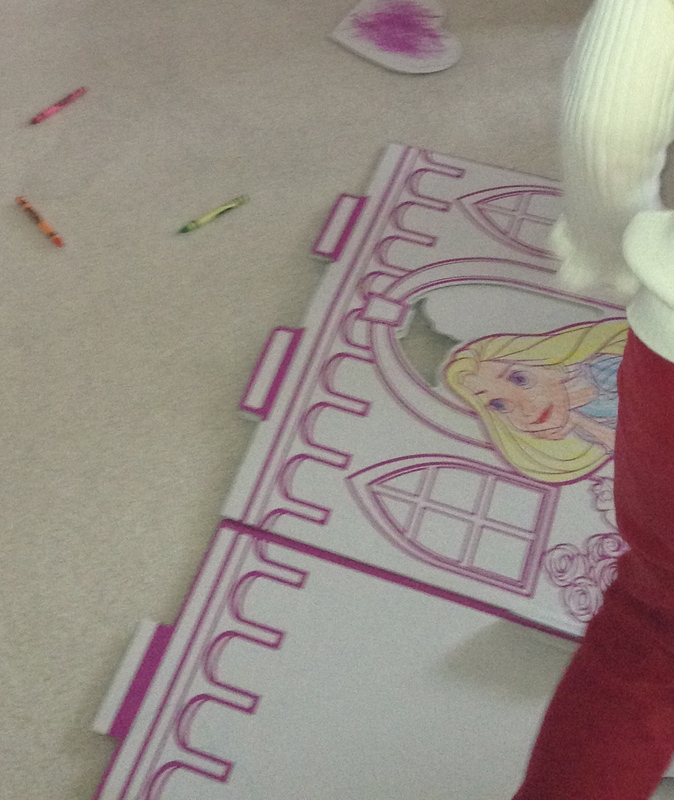 Instead, I found a cardboard princess playhouse at Target. I laid it flat in my family room with buckets of crayons for the kids to color with. It was a perfect activity for the kids to work on as others arrived or while some kids finished lunch. My daughter still has plenty left to color herself. 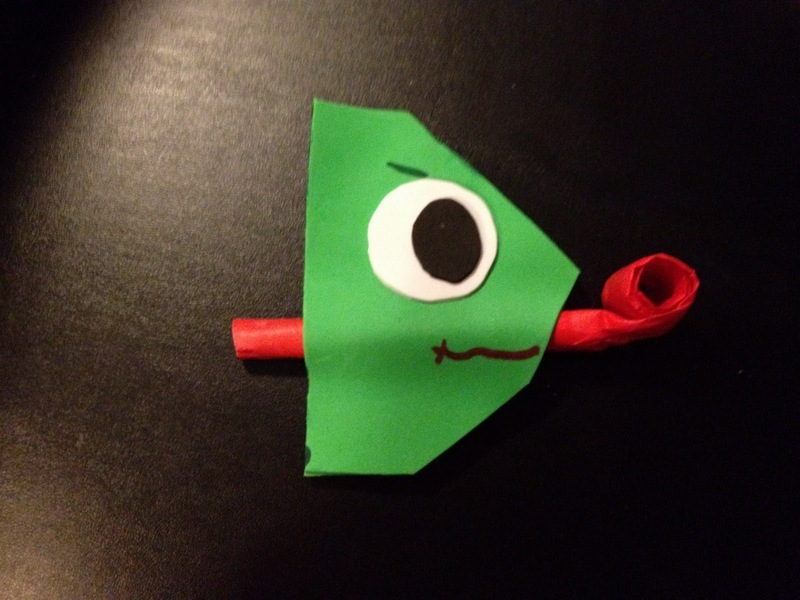 Disney’s Family Fun magazine had directions for these cute Pascal Party Blowers. As soon as I saw those, I knew we had to do them. They look so cute and easy to put together. They were cute (the kids were especially interested once I blew out the tongue on my demo Pascal). I had no problems finding the foam, although it did require a trip to both JoAnn Fabric and Michaels to find enough of the green sticky foam. However, I never thought it would be hard to find the party blowers. I arrived at Party City the day before the party and the only plain party blowers were multi-color packs with only 2 reds in them out of 8. Wow, I really didn’t want to buy 4 times as many blowers as I needed. Fortunately, I got creative and found some farm yard themed blowouts that were red and had a cardboard decoration that was easily removed. If you have time, Amazon.com has blowouts in both red and pink . They appear to have plastic ends which is an improvement over the cardboard ends on the ones that I bought. Although the review on the pink says it was too small for the Pascal craft. Celebrate Express offers several different types of party blowouts some of which would work. I also took advantage of owning Tangled (Two-Disc Blu-ray/DVD Combo) by playing the BluRay on the family room TV and the DVD on the basement TV. I also have the soundtrack in iTunes and was able to use it in a game of Musical Chairs (the soundtrack is also available to download in MP3 format from Amazon ). This was the first time I played Musical Chairs and the kids really seemed to like it. Musical Chairs is best run with two adults – one to control the music and another to remove the chairs. We played several rounds. If you want to get fancy, you could make it Musical Thrones and decorate the chairs as thrones. We also played Princess Says (or Prince Says) where the kids took turns giving instructions. I had a few other ideas ready that we never used. Disclaimer: I am an Amazon Associate, Celebrate Express Affiliate, and an iTunes Affiliate. I am compensated for sales through links to those sites. I appreciate your support of my blog by shopping through my links. A book for the grandparents of all their grandchildren would be great. I do not know how my comment got to here instead of the Shutterfly post. Sorry, will try again.